BANGKOK: Prime Minister Prayut Chan-o-cha has brushed aside a report that the United Kingdom has issued fugitive former prime minister Yingluck Shinawatra with a passport despite admitting he had not received any information about the matter. He also refused to comment on a message posted on Instagram on Saturday (Dec 2) by Panthongtae Shinawatra, the son of former prime minister Thaksin Shinawatra, that the Shinawatra family no longer wanted any involvement in politics, and longed to have the warmth of family life back. Mr Panthongtae is facing legal troubles regarding money laundering accusations in connection with the Krungthai Bank loan scandal. When the report of the UK giving her a passport emerged, the Thai embassy in London checked the information with the British authorities and confirmed it to be false. Mr Don said the government had not instructed the embassy to check the report and that the embassy had done so on its own initiative. Asked if the Thai government will be informed immediately if Yingluck is granted a passport or asylum by any country, Mr Don said it is up to that country to decide whether to inform the applicant’s country. Speculation about Yingluck’s whereabouts has been rife since the embattled former premier fled Thailand three months ago to escape a five-year prison sentence – handed down in absentia in September – over her administration’s role in the corruption-plagued rice-pledging scheme. She was ultimately charged with criminal negligence in relation to government-to-government (G2G) rice sales and is believed to have fled two days ahead of the Supreme Court’s Criminal Division for Holders of Political Position’s scheduled reading of its judgement on Aug 25. Rumours swirled that she has been living with her elder brother Thaksin, another self-exiled former Thai premier on the run to avoid a corruption conviction, in Dubai while also seeking asylum in the UK. Yingluck’s current whereabouts remain a mystery. 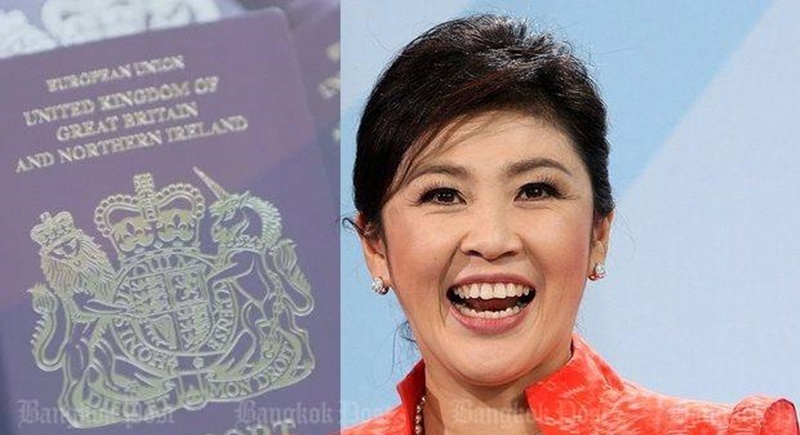 The Foreign Ministry in October cancelled all passports held by Yingluck after she failed to appeal the Supreme Court ruling against her within the stipulated 30 days. These included two diplomatic passports. The move is part of police attempts to bring the former prime minister back to serve her jail term.